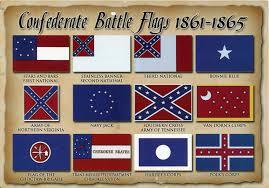 For those of you who are unaware, Tuesday, March 4 is Confederate Flag Day. So fly your Rebel flags with pride! The Southern Cross, Stars and Bars, Stainless Banner, Bonnie Blue Flag and others represent the noble Southern cause for which so many fearless men fought and died. These flags hold a hallowed place in history, and many suffered and rejoiced under the waving banners. These flags, contrary to popular belief, have nothing to do with racism, which today, is so easily misconstrued and dismissed as such. Unfortunately, certain hate groups have clamped onto the St. Andrew’s Cross as their symbol, but when the flag first originated, it was based on Scottish heritage. Confederate Flag Day, sponsored by the Sons of Confederate Veterans, is a day when everyone everywhere is asked to honor the old flags. This observance should be made in remembrance, not hatred, and show homage to the past, for the flags’ meaning is far deeper and more profound that what modern day media depicts. The men who died under the flags – some ancestors, some old friends, and some distant relatives – all had the love of their land in mind when they fought. Out of respect, we should feel obligated to honor them by honoring their flags. So fly your Rebel flags on high!